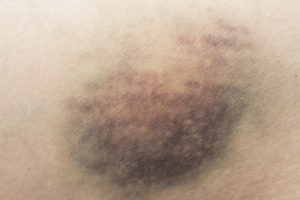 Bruises are often caused by a simple accident. But sometimes medication, a vitamin deficiency or a blood disorder is to blame. Here’s what you need to know. You may never pinpoint the source. The bruise eventually disappears, along with your concern. But bruising shouldn’t always be dismissed so easily, says hematologist Dana Angelini, MD. You may get a bruise from a bump or injury to the skin or the tissues beneath the skin. Since the skin isn’t cut or broken, you won’t see external bleeding. But damage to blood vessels below the skin causes them to rupture and leak blood. Blood pooling and clotting beneath the surface causes skin discoloration. At first, the skin is often red or purplish. As the bruise heals, it may turn brown, green or yellow. The area often is swollen, tender or painful. Minor accidents — running into furniture, falling, dropping something on your leg, hand or foot — are the most common cause of bruising. Certain medications make bruising more likely. Over-the-counter medicines such as aspirin, non-steroidal anti-inflammatory drugs (like ibuprofen), Plavix® (clopidogrel) and blood thinners (like Coumadin®) can increase your tendency to bruise. So can prescription medicines, such as certain antidepressants. “Even over-the-counter supplements such as garlic, ginkgo, ginseng and fish oil can inhibit normal platelet function and cause bruising,” Dr. Angelini says. Age is another factor. 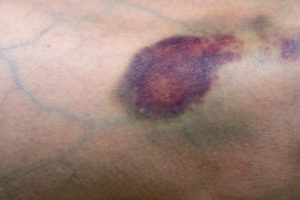 Older adults may bruise more easily than younger people. Their thinning skin often has less fat underneath to cushion the blood vessels. Shows no signs of improvement after a week. Is located on a part of your body where injury or accident is unlikely. Keeps occurring or comes back. Do any family members have an inherited blood disorder? Have you been bleeding from your nose or oral cavity? Have any surgeries resulted in above-average bleeding? Which medications and supplements do you take; have you recently started new ones? If you’re a woman, has your menstrual flow been heavier? Have you had other blood loss, such as in the urine or stool? Have you ever had bleeding in unusual locations, like the joints, muscles or brain? If your doctor decides medication is probably causing your bruising, he or she will discuss other options. “We’ll do a risk-benefit analysis,” Dr. Angelini says. “If life is going well, we might opt to keep you on the drug if it’s helping you control another disease. When the cause of bruising is unclear, your doctor will likely order blood work to check for platelet problems or other blood clotting abnormalities. But don’t hesitate to ask your doctor for help. “We do a lot of consultations for bruising. When a serious bleeding disorder is ruled out, we’re happy to provide reassurance,” she says.